The excel program can be used to track a number of different things. 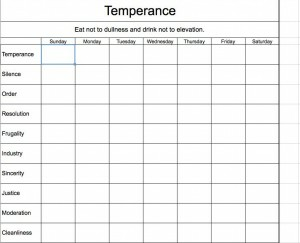 There is even a printable virtue temperance excel spreadsheet that a person can fill in and take with them wherever they go. This will help track in up to thirteen different rows each day of the week. This spreadsheet can help a person track their eating habits. These are the thirteen virtues as mentioned by Benjamin Franklin. These virtues are guidelines on how a person should live to make sure they have a happy, healthy, and productive life. Each virtue helps a person learn how to have productive interactions with others and get a feel of their own temperament. Excel arranges everything in a nice order and makes data tracking easy. 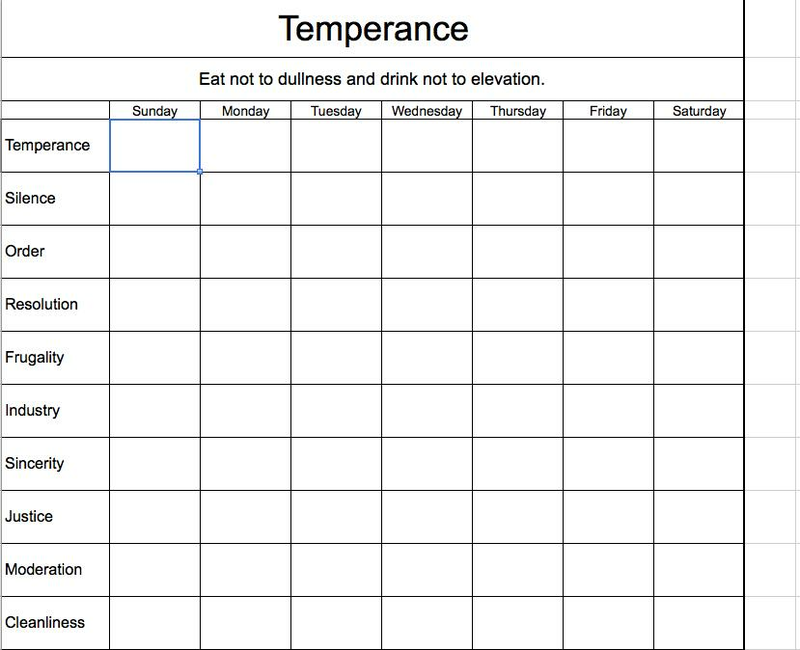 The rows on the printable virtue temperance excel spreadsheet include tracking temperance, silence, order, resolution, frugality, and other qualities that relate to a person. Each of the categories also has their own tab at the bottom of the spreadsheet which will allow a person to further track themselves. This data can be taken from the spreadsheet and typed into the excel program on the computer. If you need to you can use the graphing features for a visual aid of your progress. The printable spreadsheet can go anywhere a person can go. You take a look at the sheet from week to week and see what areas they are doing well in and what areas they need some personal improvement. Excel makes it easy to total up the columns. The spreadsheet makes it easy to keep everything organized and to keep everything from getting confused. The Excel spreadsheet will help a person learn organization and keep track of all their virtues.